darkSpyro - Spyro and Skylanders Forum - Skylanders: Swap Force - What could the Earth, Fire and Tech Spell Punks have done? 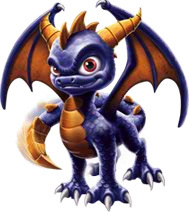 darkSpyro - Spyro and Skylanders Forum > Skylanders: Swap Force > What could the Earth, Fire and Tech Spell Punks have done? What could the Earth, Fire and Tech Spell Punks have done? In Spyro's adventure, there are eight Spell Punks. -The Air Spell Punk creates barriers that deflect projectiles. -The Tech Spell Punk creates lasers that blast from the sky. -The Water Spell Punk creates puddles that freeze those that step in them. -The Earth Spell Punk raises his allies defense, though this is pretty much useless since most of his allies are chompies who die in one hit anyway. -The Life Spell Punk heals his allies. -The Undead Spell Punk turns Rhu-babies into Rhu-Barbs. -The Fire Spell Punk enchants barrels to explode on those who attack them. -The Magic Spell Punk dies while taking forever to set up a ridiculously overblown and poorly thought-out plan. -The Life Spell Punks do their usual healing business. -The Air Spell Punks create barriers that speed their allies up. -The Undead Spell Punk raises undead trolls to fight for it. -The Magic Spell Punk does something more practical and effective in making its allies invisible. -The Water Spell Punk only appears in Bonus Missions, but it creates a barrier around its allies that freezes melee attackers who try to attack the one in the barrier. ...The Earth, Fire and Tech Punks do not appear. But if they did, what do you think they might do? Fire Spell Punks have appeared again in SuperChargers and Imaginators, and in both games, they simply throw fireballs. I think they could have done the same thing if they were in SWAP Force. Earth Spell Punks could have created breakable stone walls to get in your way (and probably in their allies' way too ). Tech Spell Punks... I guess they could create turrets, or throw mines? Those are common Tech element abilities. It's interesting that Time Spell Punks are the only ones not associated with an element. I wonder if Time would have made a good element. It would need a counterpart, though. What's the counterpart for Time? Space? Time and Space elements? Could've been cool. Vortex? I guess it's Dark nowadays, but at the time the two levels seemed to be opposites when it came to mechanic. I think Tech punks can still do the same thing with sattelite blasts, while Earth could've created a small fault line that goes toward the Skylander, kinda like Fist Bump and Crusher's attacks. Man it's weird to not have every element avaliable. Seems like VV got so focused on making wacky cutscenes for the existing ones, there were no places left to put the last 3 :I Even in SC, we're still lacking 2, but then again Spell Punk Library nearly ended up on the cutting room floor. I also kind of wished the Water Spell Punk appeared in the main story. ...I wonder what it's intro animation would have been. ...Who am I kidding, something stupid probably. Their intros weren't too bad compared to the rest, but they dragged on for a bit. Seeing the spell's effects was funny, but winking at the camera ruined it real quick.